Sports and concussions can sometimes go hand-in-hand. Each year there seem to be more headlines about the seriousness of head injuries and demands for safer sports regulations. Is this an over-reaction or should we all pay more attention? How easy is it to get a concussion while just “horsing around’? The Trauma Centre at The Montreal Children’s Hospital (MCH) of the McGill University Health Centre (MUHC) have answers to these questions. 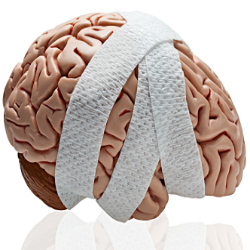 A concussion is a type of brain injury that causes a disturbance in brain function. It can be caused by a direct blow to the head, face, neck or body. It is important to note that while wearing protective headgear is always encouraged for safe play, it may not always prevent concussions. “Helmets, when worn properly, can reduce the incidence of severe brain injuries, but do not completely shield the brain,” says Debbie Friedman, Trauma Director at the MCH. “The brain is mobile within the skull. It can move from one side to the other during a hit or fall, causing a brain injury.” Friedman goes on to say that each year the MCH treats at least 1000 children and teens who have sustained sports related concussions. To help parents, coaches, teachers, and athletes better understand concussions and their impact, the trauma experts at the MCH have developed a number of resources. The MCH Concussion KiT is an educational initiative designed to increase awareness of concussions and inform parents, players, coaches and caregivers on recognizing and managing them. Wear appropriate standardized protective equipment. Make sure it fits. Wearing a helmet decreases the severity of brain injuries but it does not make you invincible. Physical preparation, proper conditioning and skill training is fundamental. Fair play which includes teamwork, sportsmanship, respecting the rules and zero tolerance to violence is essential. Consider environmental factors such as the condition of playing fields, ice surfaces, and other sports venues.